Bronxites packed into the Bronx County Building on Thursday for a hearing about proposed zoning changes in New York City. CONCOURSE — "The Bronx is not for sale!" residents chanted at a hearing Thursday night about proposed zoning changes in New York in which the community's fears of gentrification and displacement took center stage. The hearing at the Bronx County Building focused on Mandatory Inclusionary Housing (MIH) and Zoning for Quality and Affordability (ZQA), two changes to the city's zoning regulations meant to increase affordable housing. 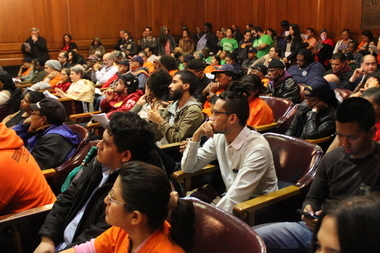 However, several Bronxites at the packed hearing blasted the proposals for not focusing enough on building affordable housing that residents could actually afford and described them as plans to price residents out of the borough, repeatedly breaking out into enthusiastic chants of "The Bronx is not for sale!" throughout the meeting. "Take into consideration that segment of our New York City society that wants to pay the rent and wants to have housing but cannot afford it," said Bronxite Cheryl Westbrook. "And right now, they are not being mentioned." This greatly upset many people in the crowd, who responded to his absence with boisterous chants of "Where is Ruben?" and "Ruben is for sale!" "I truly believe they're trying to kick us out of here," said Ramon Martinez, a 29-year-old Bronx carpenter who was at the protest. "And when I say us, I mean the middle class." "There is no Piano District," said Hillary Mercedes, who went to the hearing and lives in Mt. Eden. "This is the South Bronx." "A group of people that comes in to claim a piece of land as its own and rename it not only is a classic Columbus narrative but, as history notes, it has no intentions to preserve a community that is already there," she added. The city's MIH proposal would require that developers make sections of their new residences available at below market rate prices, while ZQA would let the city add up to 20 additional feet on height allowances for buildings to make more room for affordable housing. Several Bronx community boards have already rejected these proposals, and while the negative comments far outweighed the positive ones at Thursday night's hearing, the changes did receive some support. "This will generally translate into more units of affordable senior housing," he said. "WSFSSH strongly supports the provisions of the Zoning for Quality and Affordability."